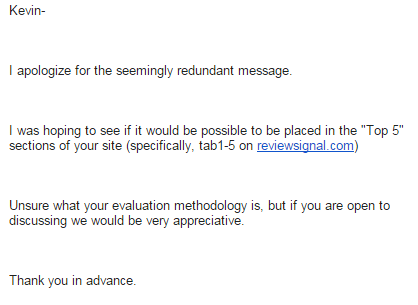 It's been approximately three and a half years since Review Signal launched. The mission was simple: provide honest web hosting reviews. (Almost) Everyone wants that. Consumers would love to not get screwed over by fake reviews/recommendations. 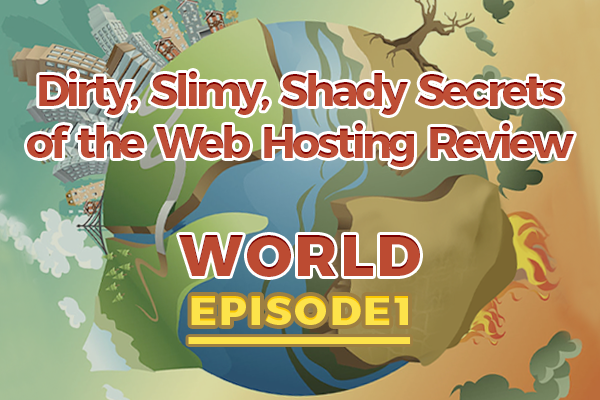 Tech savvy consumers have all but given up on honest web hosting reviews even existing. So why has it been so difficult to spread the word about what Review Signal does and why it's different? How come nobody else is really making a strong effort to do the same? The easiest explanation is money. Money corrupts everything is a pretty common belief and in the web hosting world it's practically the law of the land. Many web hosting companies are willing to pay hundreds of dollars for you to sign up new customers with them. And it's generally not the ones you would in good faith recommend to a friend. And these companies hire many people with the sole goal of convincing reviewers, bloggers, anyone with a voice that they should sell out. 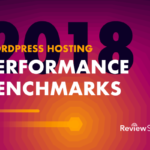 From some of the largest players like Drupal and WordPress down to the small, anonymous review sites that plague Google's search results for web hosting reviews. They have sold consumers out; for millions of dollars into their pocket. 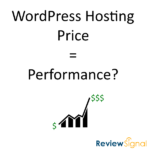 How Are Web Hosting Companies Paying Hundreds of Dollars for a $5/month plan? Let's look at underlying numbers that make this whole business possible before we continue. It seems crazy that companies could offer hundreds of dollars per sale for such small purchases. CAC is the hundreds of dollars they pay someone to send them a new customer. So the value they are getting from a referred sale must be greater than the X hundred dollars they pay. So how are they getting hundreds of dollars per customer? Lockins and cross/up-sells are the primary ones. They generally only give the super discounted rates for customers who commit to long-term contracts (1-3 years generally) and often require you to pay for it entirely up-front. So that $5/month hosting deal, may cost $180 up front ( $5/month * 36 months = $180). That's before they have attempted to sell you any extra services such as backups, domains, security, premium features, etc. They don't have to make more on any specific customer, but they know in aggregate how much extras they are going to sell. 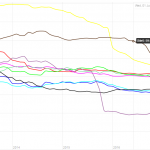 If you're really curious, I dug into the financials of some of the publicly traded companies (EIG, GoDaddy, Web.com) to see what some of those numbers looked like. They were getting between $100-180 per subscriber per year. I'm also fairly sure that most customers stay for longer than a year. So if companies are extracting $180/year/subscriber, paying a $200 commission for a new subscriber is a no brainer if the new subscriber stays over 14 months. Suddenly, the economics of these incredibly high payouts should make sense. Corruption doesn't happen in a bubble. Someone has to be corrupted. In many cases, it would seem the pure motivation of making a lot of money is enough. Most people create a site dedicated to pimping their visitors to the highest paying companies. In other cases, there is blatant astro-turfing going on. Perfect example from the techcrunch article about reviews being a cesspool, now deleted of course. But the most hidden corruption happens behind the scenes. It's the people with titles like Affiliate Program Manager and Partner Marketing Specialist. For many of these companies, their job is to try to convince people to use their brand/authority to sell the company's product for a commission. 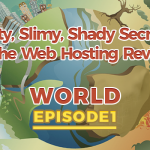 What Happens Behind The Scenes of Operating a Web Hosting Review Site? I'm going to show you exactly what kind of offers I get regularly here at Review Signal. This is just a tiny sample of the 'offers' I get regularly. 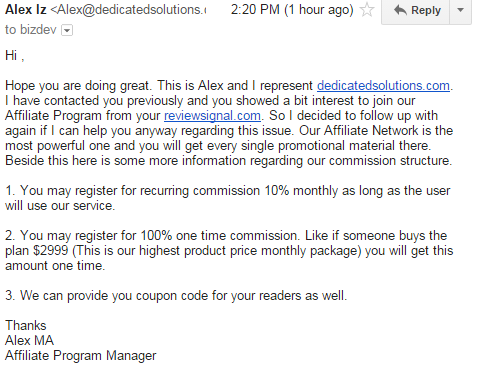 Most look like the email from dedicatedsolutions, trying to convince me to sign up for their affiliate program. Some, like Eli Saad from domain.com straight up tell me that my rankings are for sale (really classy). 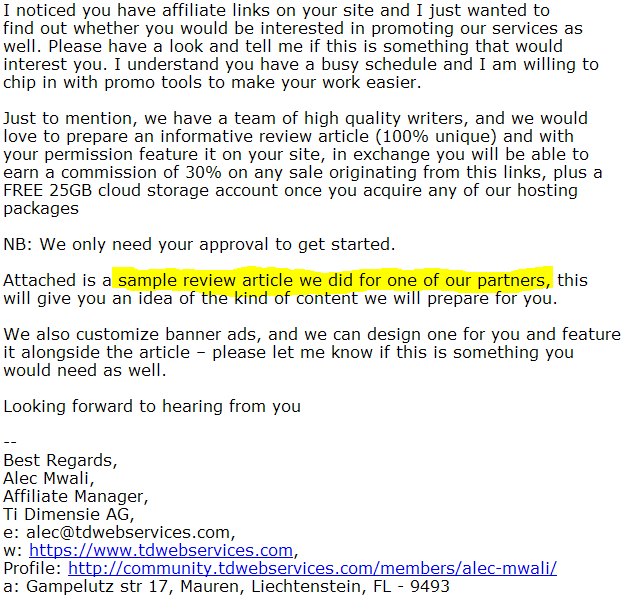 Alec from tdwebservices won't stop spamming me and refuses to remove me from his list, while literally offering to provide reviews of his own company for me to publish (vomit). Scroll to the bottom for bonus Alec Mwali material. And I've redacted someone from InMotionHosting's name because they were extremely apologetic, but they asked to be placed in the top 5 (sorry, they are based on actual reviews, not paid for). A lot of companies just ask to be listed and mention their affiliate program as the reason why it should happen. They don't even think twice about what they are implying, it's become so ingrained in the culture of web hosting reviews that they are all for sale that nobody even takes a moment to realize how f***ed up that is. Consider this me putting up notice, I will be periodically publishing the slimy emails and offers I get here at Review Signal. You may be named and shamed. So don't do it. 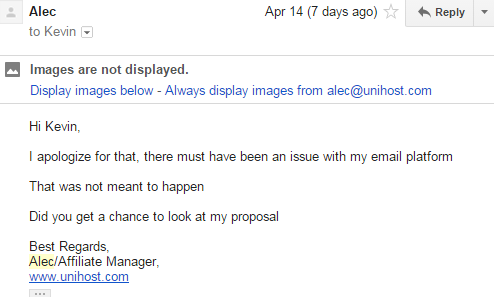 Alec has contacted me on behalf of TDWebServices, Unihost and Codeguard. He has sent me full word docs with fake reviews to publish. He repeatedly uses the fake 'Re:' topic to get people to open and read his emails. When called out about it, he claims it 'was not meant to happen' and it 'keyboard error' or an 'issue with my email platform'. I think you better invest in a better keyboard and email platform, because your current one seems to be stuck in spam mode. This entry was posted in Featured, Review Signal News, Web Hosting and tagged alec mwali, codeguard, dedicatedsolutions, dirtyslimyshady, domain.com, hostgator, inmotionhosting, spam, tdwebservices, unihost on April 22, 2016 by Kevin Ohashi. Hi Kevin! Another enjoyable read! Reminds me of the time you had it out with the Faculty and got your way! Keep it up! It’s a little disheartening when you see someone like Paul Underwood (Paulund) cash in and represent Bluehost and WPEngine. One could argue that posting for WPE isn’t cashing in, but Blue Host? It’s discouraging how the posts feature no commentary, no personal experience, rather, seem to be written by the marketing departments of each host. This is not a service to the WordPress community, this is selling out. Great post. I’m new to the industry working as Account Exec. for a privately owned data center with excellent hosting, but due in part to them not participating in this kind of activity, have very little online presence. 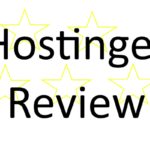 I have submitted them to some review sites that will list to receive customer reviews, such as hostsearch.com and hostadvice.com, but without paying way to the top has been ineffective. What is your advice for a company to gain more natural notoriety, without partaking in this activity that unfortunately works well for many other companies? How do we combat this seemingly “industry standard”, when any review sites/directories saying similar things and how they are against this, essentially do the same thing and will only list if you pay? The reality is, they won’t list you in most cases. Or won’t list you anywhere that people actually visit. If you want to be completely ethical, you need to find other channels. There are plenty of individuals who aren’t sharing information solely for profit. But it’s a lot more effort and the conversion is probably lower reaching out directly to these people and building relationships. If you’re running a data center, it seems the challenge might be that it’s even more commoditized than many parts of the hosting world. But at least with hosting, you’re free to innovate on the software side quite a bit which is where you see some of the newest growth coming from.